He gets very angry when someone says he’s cute and trust me, you won’t like him when he’s angry. The finished toy is just shy of 6 inches tall (which means you should be extra careful around him, because he has a MASSIVE inferiority complex) and uses 8mm plastic safety eyes. It was a quick crochet, taking an afternoon-ish. Other than a brief bit of confusion when working the legs, the pattern was easy to follow. Contrary to the pattern, I chose to stuff the arms and not the wings. I take no responsibility if you make one and then die a messy death. I gave mine away as a precaution. 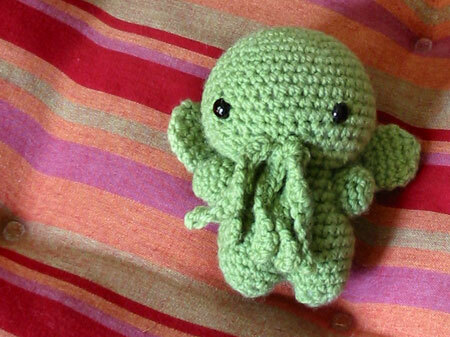 CogKnition posted this on August 17th, 2009 @ 12:10am in Crochet, Finished Objects, Toys | Permalink to "Cthulhu"